Ulcer present for 5 years before study entry. 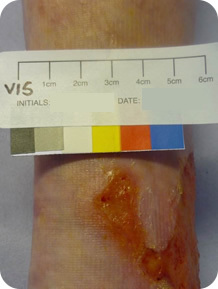 Ulcer size = 15.4 cm2 at study entry. 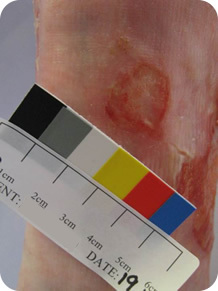 Re-epithelialised ulcer after 7 weeks of treatment with VitroGro® ECM and standard care. Ulcer present for 7 years before study entry. Ulcer Size = 4.4cm2 at study entry. 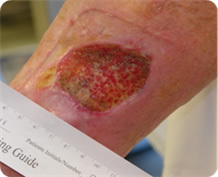 Re-epithelialised ulcer after 8 weeks of treatment with VitroGro® ECM and standard care. Case study 3: Treatment comparison with adjacent ulcer. 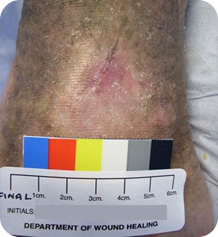 Treatment: VitroGro® ECM applied to study ulcer (left) only while adjacent ulcer (right) remained untreated. Study ulcer (left) duration: 3 years. Ulcer Size = 2.0cm2 at entry to study. Adjacent ulcer (right) duration: 3 years. Study ulcer (left): Ulcer area reduction. Adjacent ulcer (right): Enlarged and deteriorated. The wound here is covered with thick fibrin at week 8. 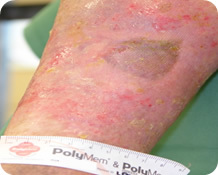 The adjacent ulcer (right) receives standard care, and the study ulcer (left) is receiving standard care plus VitroGro® ECM. The study ulcer is filling in and the adjacent ulcer is starting to migrate towards the treated ulcer. 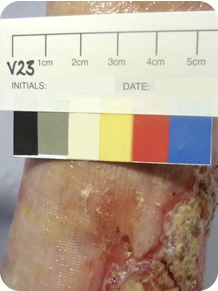 Now the study ulcer (left) has fully epithelised, and the adjacent ulcer (right) and surrounding tissue has broken down, extending towards the study ulcer. The re-epithelisation is very clear and the slough can be seen on the adjacent ulcer. There are no cells able to repair the adjacent ulcer. The deterioration has quickly occurred despite the healing of the study ulcer. 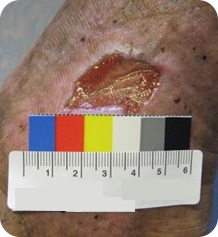 It underscores the clinical importance of wound area reduction.